While I am actually not a cat person (somewhat, I mean I don't dislike them, I prefer dogs for running around with though.. I guess I'm more of an outside-ish person),Then again, I do like lions, they have nice manes, sleep a lot, don't do much hunting either.. so yeah, Arahbo gives off a pretty good vibe! plus the art looks absolutely amazing so I just had to make a deck. Also - if I mess up the name a little it could be Arahbou! Hah!, Arah-Bou? get'it? Ah well.. 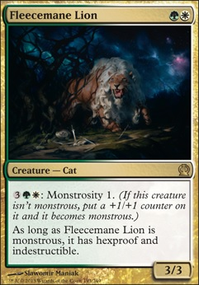 Anyway, this new cat commander allows for mixing the best of cats! green and white, some red would've been good for Wild Nacatl for example. But now we can at last make a real cat tribal without using Krond the Dawn-Clad or Karametra, God of Harvests, where someone always churns out the crazy catlady-joke.. sigh. There's a little bit of +X/+X'ing, a little bit of lifegain, and a little bit of vigilance and trample. Another approach would be more focus on Cat Tokens but I decided not to do that, I already have a token deck in my EDH Ishkanah, Queen of Spiddies! and its time for a different approach imo. The lifegain is there just in case, I didn't necessarily focus on it, because you usually end up being a target if you keep gaining life, but it's nice to funnel into my Sylvan Library and keep drawing cards. Keeping this in mind, im curious as to how Regal Caracal will perform as it gives everything lifelink.. 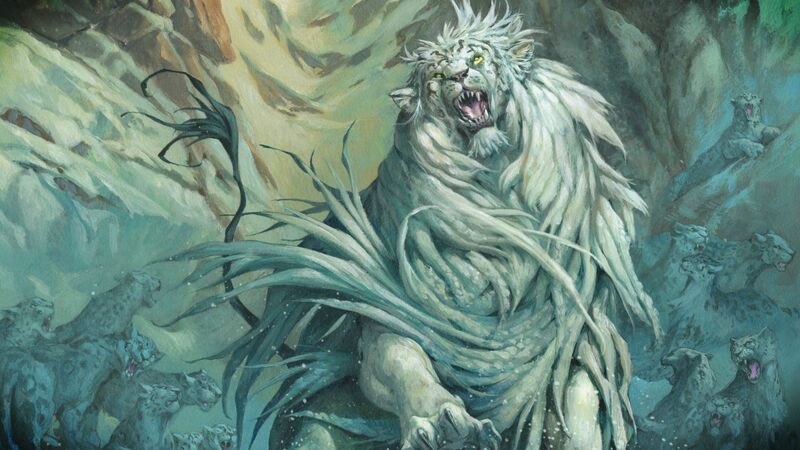 Some cats, most notably Brimaz, King of Oreskos, already have vigilance on their own, but it seemed like a nice inclusion so I'm adding Always Watching to help out all the other kitties. The added +1 is a nice bonus. Spear of Heliod is here as well for that reason, but can be used to poke creatures that attack us. These two are probably the next ones I'll cut out though. Now when Arahbo, Roar of the World does manage to empower our kittens, we need to make sure they don't get chump-blocked. 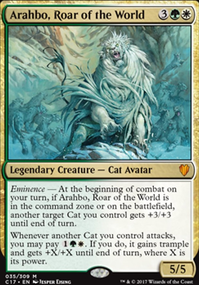 Giving everyone trample with Arahbo's ability can get a little expensive depending on how many cats we keep but this is where Primal Rage comes in. Coat of Arms is pretty self-explanatory, unless we're facing off against a token deck we should always have the upper hand. luckily, I'm the only Tribalist in my playgroup so this should be fine. Similarly, Mirari's Wake is also a must-have. +1/+1 and double mana will work wonders with either Arahbo's ability or Jazal Goldmane. Doubling Cube is included for the same reason. It could probably use tutors for some of the enchantments to help things speed up but I'm not sure if it's really necessary? Thanks to the low CMC you burn through your hand pretty fast (as with most of my decks lately), so more draw should help. Aside from that, if there's anything you think I missed that should be an absolute inclusion, let me know in the comments below! I've played with the precon now and I feel so disappointed. Dragons, Vampires, they completely overwhelm. The only reason Wizards didn't steamroll us as well was because the poor guy couldn't get his lands together. Arahbo? where is he? where is his power? This mighty primordial being.... The flyer in the box actually describes him as " clever, perceptive, assertive, poised and a vicious hunter". Perhaps in theory - in practice.. far far far from it.